"To Assume is to Make an A$$ out of U and ME"
...Et cetera, et cetera, et cetera, but the general gist is that it is very easy to make mistakes when we are doing genealogy research. So, despite the fact that I've been researching my family trees for the past 7 years, and feel fairly comfortable with my skills of deduction and reasoning, I am still continually learning and improving my research skills -- one of the biggest lessons that I've learned is to not get set on what I think to be the right answer when I know that I haven't asked all of the right questions, and to not frustrated and give up when I've taken the wrong path. In 2010, armed with a bunch of information from my most trust-worthy Barnes/Smith family source, my Aunt Mary Alice Barnes Brock, I started digging deeper into my maternal Barnes family research. 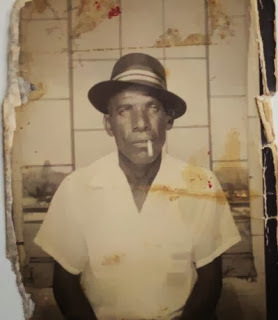 I had primarily focused on my searching my dad's Ruffin/Pearson side, so after several phone calls picking my Aunt's brain, I loaded my new findings into my tree on Ancestry.com. When I'd asked her the oldest Barnes ancestor name that she knew, she told me that it was her father's father, Cal Barnes (whom she'd never met). She didn't know much about him, other than her dad referring to his father by the name "Cal" and saying that she remembered a big picture hanging in her dad's house of a very fair-skinned man with green eyes. Nonetheless, I got caught up in my own research and blind hope that I had located my great-grandfather and his parents. I gleefully loaded them all into my tree and claimed them as my own, based on nothing but the census records. I was even more excited when I found Archie's parents, Samuel and Dorcas Barnes, living nearby. I began to research them as well, and was ecstatic to randomly Google Dorcas' name and found that she had applied to be recognized in the Five Tribes as a Native American and despite being rejected, I rejoiced in the fact that I was able to get the names of all of her brothers, sisters, nieces, nephews, and most importantly, her Indian father and black mother! During all of this research, I had built up quite a community of contacts I had made through Ancestry.com of other hopeful Barnes "cousins" searching for family ties. I couldn't completely shake the nagging feeling that the facts of Calvin Barnes' birth year and residence location in the census didn't quite match that of my Cal Barnes, and even tried to be cautious in not telling these other folks that this was definitely my ancestor, but, the excitement of the find, and the fact that there were so many others that were benefiting from the information that I had gathered and shared online drew me into the belief that I had been successful. I believed my own hype to the point of even meeting some "cousins" in person I had connected with online while attending a reunion for my dad's side in Mississippi in 2012. During that same trip, on the advice of Aunt Mary Alice, I arranged to meet some descendants of my great-uncle Coleman Barnes (my grandfather Lee's brother), who still lived in the area where my grandfather and his siblings grew up. It was a wonderful and enlightening visit, especially so when my new cousin Caroline excitedly told me that her sister Janice had also been researching the family tree for several years and that I should contact her. Although Caroline didn't know as many details as she said her sister did, she did share a tidbit that would change the course of my research on Cal Barnes. She referred to him as "Carrol," a name that I had come across in my search of the 1870 census, but dismissed because I was looking so diligently for "Calvin." One thing that I quickly picked up was in the way that she said the name. Being raised a "Northerner," I had always heard the Southern inflection in the way that my mom and dad said certain words, and speaking to Caroline and her family was no different. When she said our ancestor's name, my ears heard "Cal," but not until she spelled it, did I realize that she was actually saying "Carrol, " which is likely what the censustakers also heard when they wrote the name down in the later census records. I just didn't have my mind open to the fact that the census could have been misleading in this respect. When I returned from my trip, I promptly called my cousin Janice and we happily spoke for hours about our research and shared family line. She confirmed that, based on trusted family sources, our 3x great-grandfather's name was Carrol not Calvin, and that his mother's name was Sophronia, not Archie and Harriet as I had previously believed. With this new information, I had to swallow the fact that months of research into Calvin Barnes and his family was now rendered useless to me -- THEY WERE NOT MY FAMILY. Although this was devastating to accept, it wasn't completely a loss because the effort wasn't wasted. 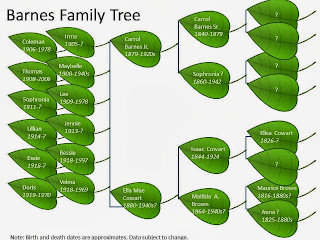 In gathering and sharing the research that I had done on the Samuel and Dorcas Barnes family, I was able to help countless researchers with holes in their trees. I was able to provide documented proof of their ancestors' family names and rare, historical data about the lives of their ancestors during slavery as provided in their own voices in the Dawes interviews. My research also provided them with verification that they did, indeed, have Native American heritage, and they learned their ancestor's English and Choctaw names. I was also able to unify several present-day African-American researchers with their Native American cousins through Ancestry and Facebook. I was also able to share photos of family members with others who had never seen them. So, although it was my loss and their gain in respect to my research, it was my gain in respect to my being able to assist someone else, and that was priceless. And, it wasn't a complete loss where my research is concerned because I did get to meet a whole family of my true cousins, find a kindred genealogy spirit in my cousin Janice, and learn who my real ancestors were, expanding my family base exponentially. The biggest gain that I have gotten out of all of this is that I was instrumental in assembling the first family reunion unifying the descendants of my grandfather Lee Barnes and 4 of his siblings this past Memorial Day in Yazoo City, MS! It was so incredible to gather all of these cousins who literally lived in the same community for generations, but didn't know one another, and to see the family resemblances and love shared among us was one of the most enjoyable and rewarding experiences I have ever had. So, sometimes when we make mistakes, we have to not be defeated by them. We need to learn from them in order to not make them again (i.e., verify all information, get as much documented proof as possible, don't make assumptions), but we also need to learn how to turn every opportunity into a positive because the rewards reaped can be greater than you ever imagined! because we are all competitive, but good-naturedly so. My genealogy twin cousin Janice and me, who met for the first time that weekend. (relatives of my maternal great-grandmother, Ella Mae Cowart Barnes). 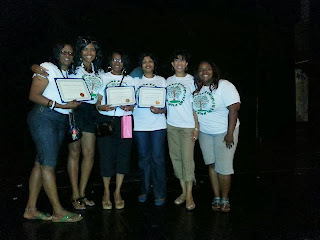 I had previously "met" cousin Sharron (in blue shirt) via Ancestry.com. 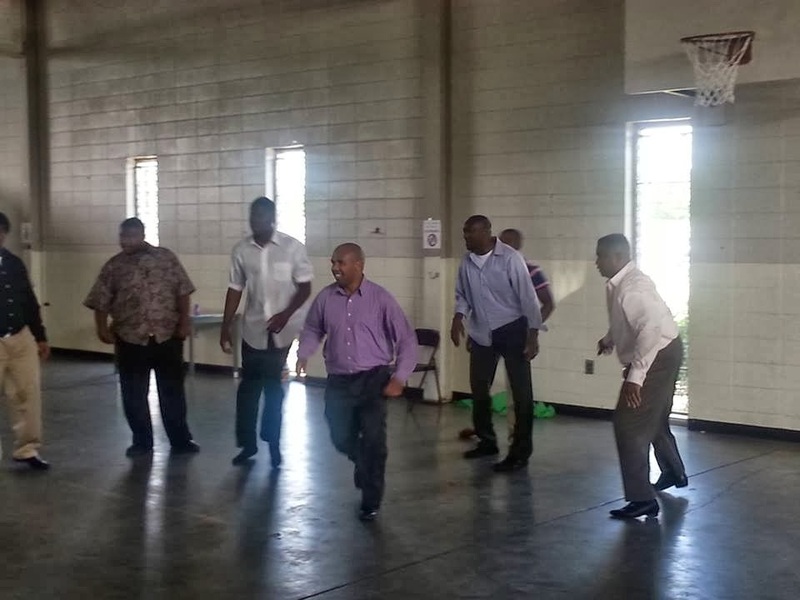 After our closing family church service on Sunday, the cousins couldn't resist a rousing game of basketball! Players included male and female, young and old, suited and casual dress, skilled and not-so-skilled, and a few men of the cloth like my cousin, Pastor Eric Barnes (in purple shirt). Foreword: I initially wrote this document in 2012, while still in the early stages of finding out about Carrol Sr. and Sophronia. I am constantly updating it as I find out more. I hope to be able to continue to refine it as I learn more. This family history was made possible through years of ongoing research by Janice Barnes Bridges and Renée Ruffin Merrill, compiling years of census data and other historical documents, but most importantly, the great stories obtained from family members, such as Radie Dagins Barnes Hill, Nellie Mae Barnes Williams, Mary Alice Barnes Brock, and others. Without those who came before us, there would be no history, and without them, these stories would not be told. 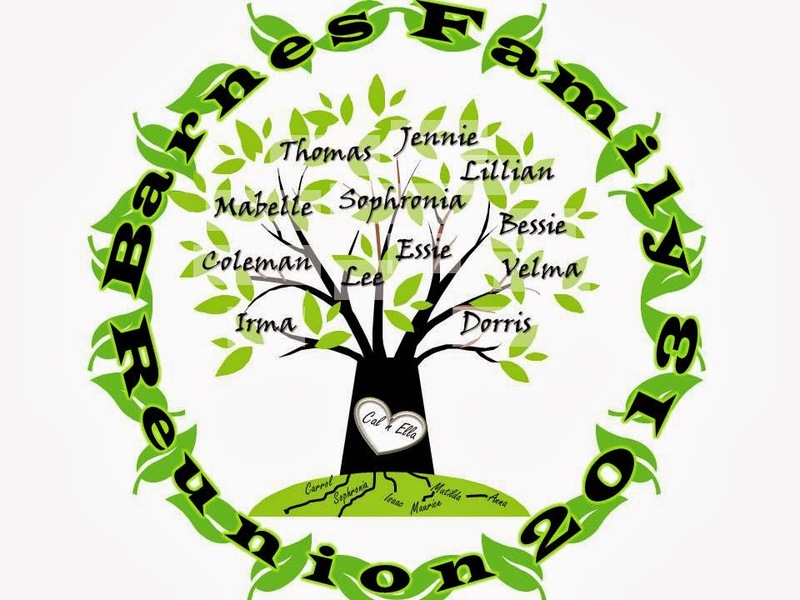 The earliest known ancestors in the Barnes family are Carrol and Sophronia Barnes. Not much is known about Carrol Sr. aside from seemingly conflicting family stories, which would imply that there was some confusion as to whether Sophronia was wife to, or mother to, my great-grandfather, Carrol "Cal" Barnes. Further research confirms that there were, in fact, TWO Carrol's, the son being named after the father. Carrol Sr. is found in the 1870 census, living with two other people (their relationship unknown) as a single 28-year old farmhand. Family stories describe Carrol as being part-Native American, and even passing as White. No further mention was made of Carrol in the census, but, by a stroke of luck, I was able to find him mentioned in the 1910 Publications of the Mississippi Historical Society as an active member of the Loyal Leagues (more info on this in a future post). This likely took place shortly following the abolition of slavery, as the Loyal Leagues were intimidated out of existence by the early 1870s. Based on the ages of their children, it appears that Carrol might have married Sophronia in or around 1878 and died sometime between 1879-1880, as he does not appear with the family in the 1880 census. 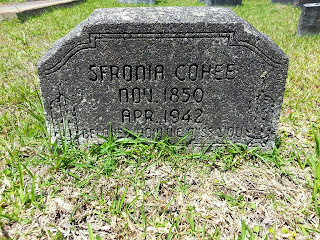 Sophronia’s parents and maiden name are unknown, but according to the census, she was born in Mississippi in December of 1860. Family stories describe “Fronie” as a part-Indian (Shoney/Shawnee?) woman who came from either the Fernwood or Cheraw communities near Foxworth, MS. At the age of 21, Fronie was already a widow and mother of two children – 2-year old Jennie/Ginnie and 1-year old Cal (Carrol Jr.). Cal was said to have had green eyes and was considered a mulatto throughout his life. Fronie worked as a farmer to support her children. At this time, she lived in Beat 5 of Lawrence County. The day after Valentine’s Day in 1883, Fronie married Sandy Cohea, a local farmer from North Carolina, who had also recently been widowed. Although Sandy was 22 years her senior, Fronie combined her household with his, becoming stepmother to his 5 children from his first marriage to Rebecca Haywood. By 1900, Fronie and Sandy’s household included his older daughters Polly Anne, Elizabeth (Lizzie), and Jane; Fronie’s daughter Jennie/Ginnie; and the 14-year old daughter they had together, Estelle. In 1903, Fronie’s son Cal had also married – to a woman named Ella Mae Cowart. Ella was born in 1883 in Lincoln County, MS to Isaac Cowart (1846-1924, MS, to Elisa Cowart, father unknown) and Matilda Brown (born 1864, MS, to Maurice and Anna Brown), and was the eldest of 9 children. Ella was said to have been mulatto according to the census. By April of 1910, Cal and Ella were still farming and had had 4 children – Irma (b. 1905 – could she also be Mabelle? ), Coleman (1906-1978), Thomas (1908-2006), and my grandfather, Lee (1909-1978). They lived next door to Cal’s stepfather Sandy and mother Fronie, who had since added daughters Minnie and Mattie to their brood and also included in their household 7 grandchildren: Boss Davis; Maggie and Dora Belle Cohea; and Stella, Elija (Eli), Josephine, and Lizzie Brown. The whereabouts of Cal’s sister Jennie/Ginnie are unknown from this point forward. The 1920 census shows Sandy and Fronie still living in Lawrence County, now with 4 of their younger grandchildren, Maggie, Elija, Josephine, and Lizzie/Bessie (?). Meanwhile, Cal and Ella’s family grew to include 7 more children: Alice-Sophronia (1911-1967), Jennie (1913-? ), Lillian (1914-1965), Bessie Mae (1914-2001), Essie Mae (1918-1957), Velma (1918-1969), and Doris (1919-1970). Although neither Cal nor Ella were said to have attended school, both were able to read and write. By 1930, it is believed that Cal had died, as he is no longer found in any census records, and Ella had become remarried to a man named Solomon “Bunch” Stringer on Feb. 5, 1926. Living with them in Wanilla were 5 of her younger children, including Lee. Their son Coleman had taken up work as a farm laborer, living with the family of William Baylis, who would ultimately marry Coleman’s cousin Dora Belle Cohea. Several of the siblings went to work in the active logging industry. Fronie, now widowed, lived with her granddaughter Dora and Dora’s husband until her death in 1942. Although the 1940 census shows her being 95 years old, according to the earliest census Fronie is found in, 1880, she was born in about 1860, making her 80 years old. 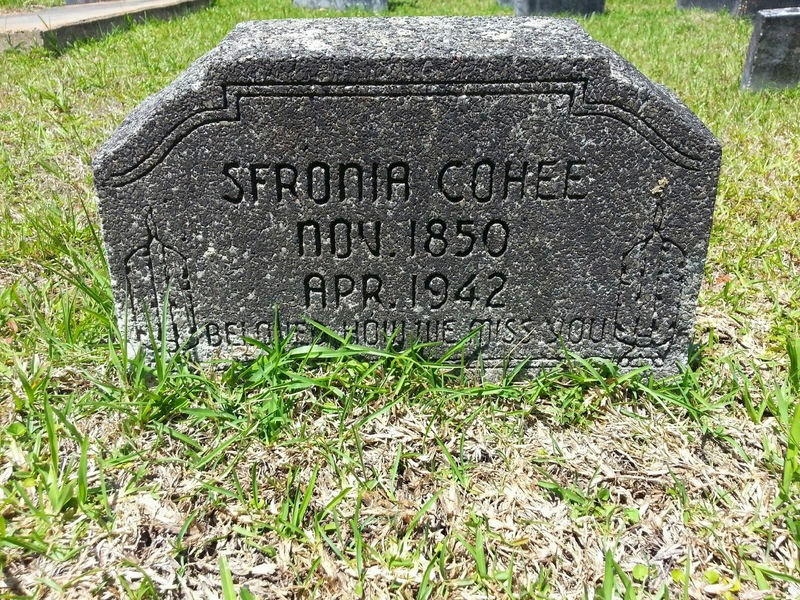 Sophronia "Fronie" Barnes Cohea is buried in Oak Grove Missionary Baptist Church Cemetery in Monticello, MS.
Research is still being done, as the 1940 census for Mississippi is only now being released (as of Apr 2012). We have not yet located Ella Mae Cowart Barnes Stringer in this census. We do know that several of Cal and Ella’s children had married by 1940, though. 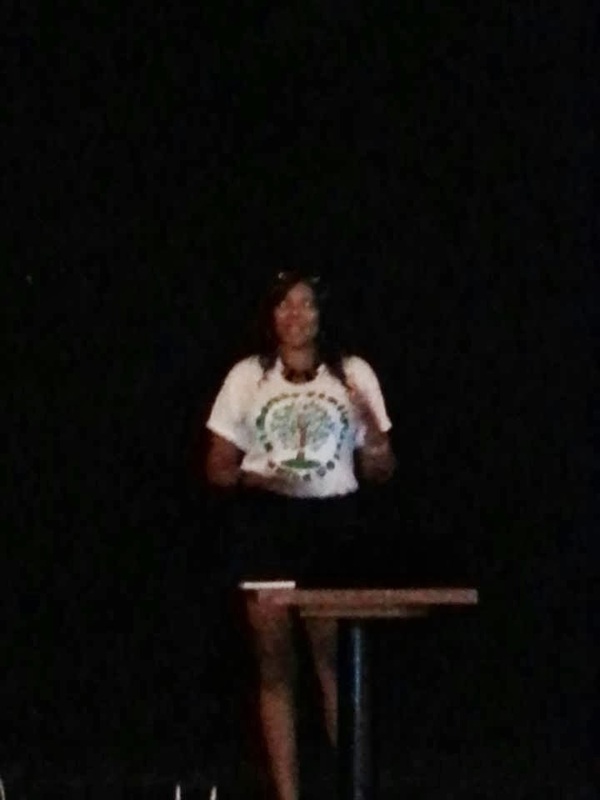 Mabelle had married Rancy Johnson in about 1923 and moved to Yazoo City, MS. No known chilldren. Bessie attended Shady Grove M.B. Church (Silver Creek, MS). Coleman, Velma, and Essie all attended Oak Grove M.B. Church of Monticello, MS (all 3 buried there along with their mother). Lee Barnes attended Springfield M.B. Church of Yazoo City, MS and is buried there. Where to begin? The beginning! 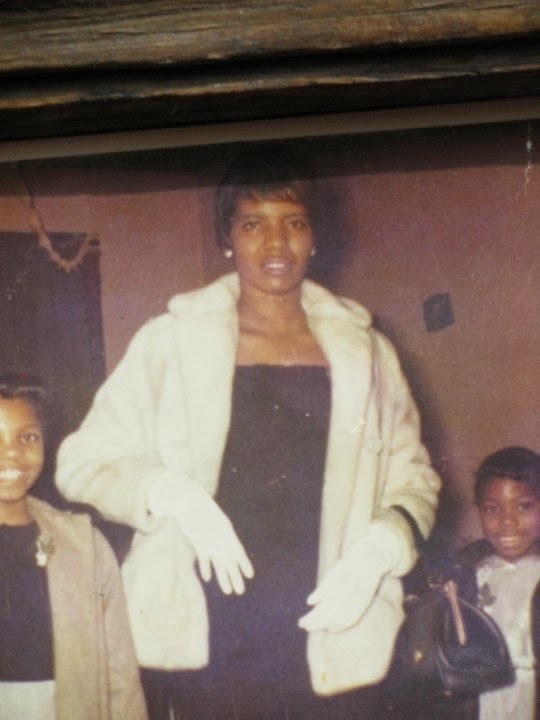 When I sat down to think about what this blog was going to be about, I initially thought it would primarily trace my mother, Irene Barnes Ruffin's family history: the Barneses, the Smiths, the Cowarts, the Browns, the Suttons, the Baggetts, the Williams, and so many others. But then I began to think about my closest tie to these past ancestors - my mom. I also want to write about "Irene Barnes," the woman that I knew and loved, the most unsung person I know. She only lived for 53 years, but she packed so much love into that time that it was as if she had lived several lifetimes. Still, now that 20 years have passed and I have two children of my own, I find that there's so much I want to ask and show and share and laugh about with her. Most of all, I feel like she is the type of woman, the type of person, that I strive to be, so I often ask myself not only WWJD, but WWMD (What Would Mama Do)? So, I try my best to pattern myself after her, and one of the best ways that I can think to do so is to acknowledge and honor those who paved the way for me - my elders and ancestors. My mom struggled with high blood pressure and heart problems her whole life, and when she died suddenly of a heart attack in 1990, we all probably should have seen the signs, but none of us were prepared for it. Can you ever really be? So, one of the hard lessons she left me to learn was to take better care of my health and to let others know when I wasn't feeling 100% rather than suffering in silence. There were so many areas where I was left wanting with the loss of my mom, but knowing more about our family's health history came to the forefront after her siblings started dying in the years immediately following her own death. So, this, combined with the fact that my mom passed one month before the family reunion we were planning to hold - finally bringing her siblings to our home in the North (a REALLY big deal for a family of people who basically stayed in the same area of Mississippi for 150 years) - and that now, our plans were for a funeral, led me to wanting to know more about my family, both the living ones as well as the deceased. So, I'll probably be bouncing around, topic-wise, as inspiration takes hold, so bear with me. There WILL be a lot of genealogy-related posts, but sometimes, it might just be about what I ate for lunch. It might be a bit of a bumpy ride, but I promise that we'll laugh every now and then (well, one of us will), and that hopefully, I'll learn more about myself as I learn about my family history.